One of the items on our bucket list has been going on a small cruise preferably with land either side, so when the opportunity arose to take a cruise down the Rhine, in the company of two of our favourite bands, (Show of Hands, and India Electric Company) our names were among the first ones on the list! On the first day the sun shone and we all sat out on the top deck enjoying the warmth of the sun. 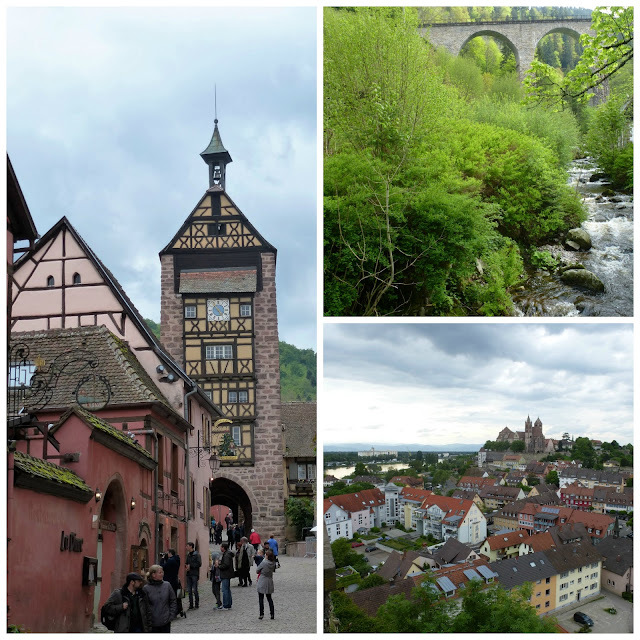 We glided along the winding Rhine river, admiring the ever changing scenery of quaint villages and old churches, some lining the water;s edge and others clinging to the sides of the hillsides. Crowning the top of the hills are many ruined castles that were once maintained from the tolls that were charged to allow access along the river. Vines also terrace the steep hillsides, it must be quite a task to maintain and pick the grapes! Half-way through the afternoon it was decided that it was safer to allow our boat to proceed down river rather than stay where were. We were apparently the only boat out of the 1,600 vessels that on average use the Rhine on a daily basis who were given permission! We proceeded slowly as there were concerns that due to the high water level that we might not be able to fit under the bridges, some did look quite close! We reached Strasbourg and although the boats weren't allowed further for a few days it did allow us to get out and visit other places. 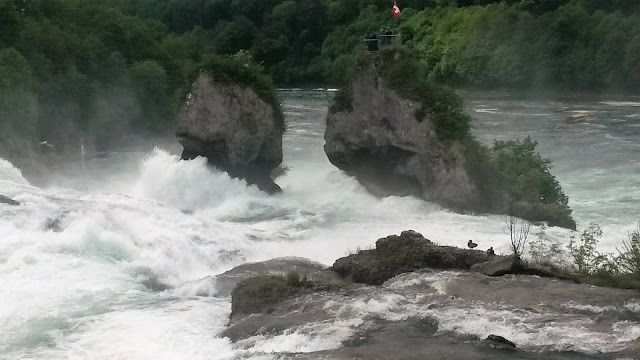 We also visited the Rhine Falls in Switzerland, which is the largest waterfall in Europe and felt the power of the water has it thundered past us! We were told that it was at it highest flow level for 100 years! The two ducks sitting on the rocks (mid-right of the picture didn't seem to mind the noise or spray! Despite the high water levels and eating too much food we had a wonderful time. It was a relaxing way to travel and see so much. It's amazing how many goods are still transported along the river and despite passing some industrial areas we won't forget the wildlife we saw. The storks flying over head were a highlight for me. Have you been on a cruise or visited this part of Europe? Returning home, everything has grown so much in a week, so we shall be busy this week in the garden and catching up on other blogs. Wishing you a happy week, sorry for the long post! Great photos. It looks like a great trip. The weather is strange all around the world. What a wonderful journey. 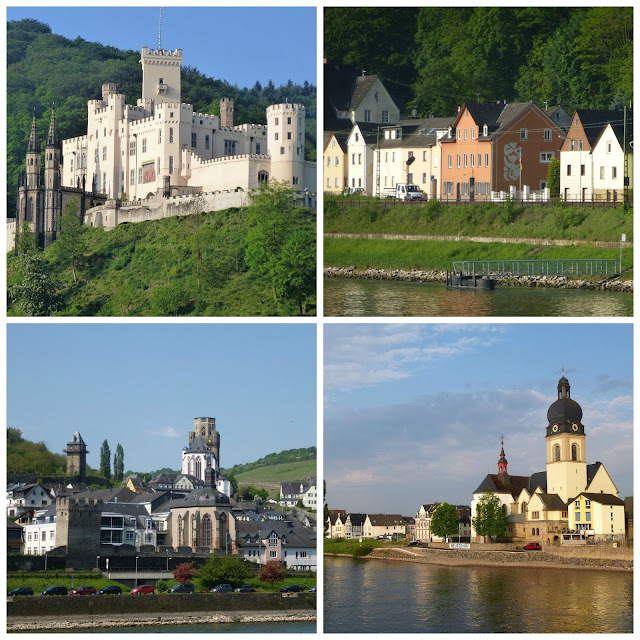 Yes, we have a lot of castles at the Rhein. Strassbourg is a nice City, and a winetasting I would like too. Sorry that you had somethimes so bad weather! Glad you had a great time even if it was a little disrupted by the weather. Your picture of the stork on its nest is amazing. The castles are so beautiful aren't they!! It sounds wonderful! The couple that lead my music group at church were on one of the other 1600 boats that weren't allowed along to Strasbourg last week so they ended up in Basel being bussed along there. Dear Sarah - this too is my kind of cruising - land on either side, things to see on the journey as the boat passes through. I have travelled down the Moselle and part of the Rhine, but loved it. Sometimes an event such as the flooding can make the journey even more memorable and interesting - your pictures have captured it all so well - love the rooftops. Great photos too thank you for sharing. In 2007 four of us from OZ cruised from Amsterdam to Budapest. It was wonderful. My highlight was Bavaria and would like to go back one day. 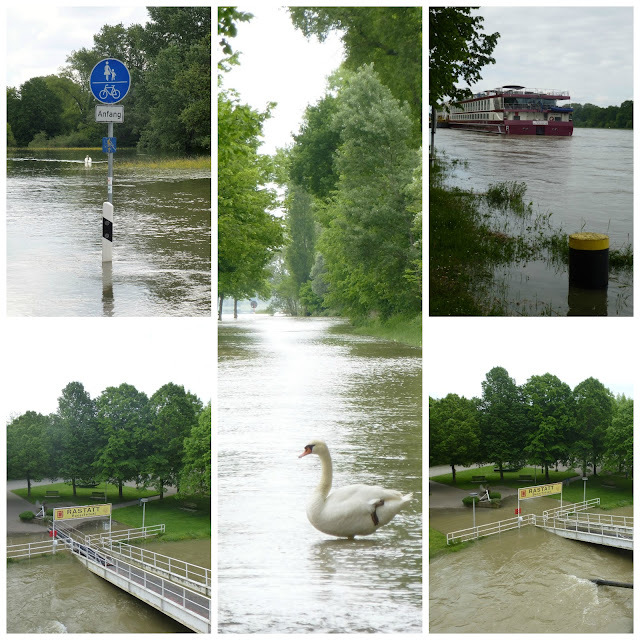 We had a problem with rising flood waters when we were in Vienna and in order to go to the opera that night the boat left with out us to get under the bridges and we were bussed to Bratislava after the opera. All part of the adventure. Your experience reminds me of our failed Danube cruise! The plan had been to go from Linz in Austria to the Black Sea, but in the end we did hardly any cruising, because there was massive flooding of the river. Looks like you fared rather better, despite a couple of hiccups. The scenery is wonderful! As you know, we lived in Germany for a while and there it was always said to be good luck having storks nesting on your chimney. Wow that looks amazing. I've never been out of the UK (well, actually I did go to Gran Canaria when I was 16) and don't even have a passport! There are so many places I'd love to visit and this looks like another to add to the list! Those waterfalls looked amazing with so much water flowing over. Sarah! Good morning and greetings from the USA! I have never taken such a cruise in Europe, and I would love to. I think having land on either side of you could be a much more relaxing feeling than being out in the open sea, besides, you get to see so much beauty! Enjoy the rest of your spring! LOVELY PHOTOS! Very interesting cruise, Sarah. Sounds like a real, unplanned adventure! Lovely photos, looks like a very nice and interesting trip! Wonderful pictures of your Rhine journey. A nice and quiet way of travelling, enjoying the scenery and the music on board. It sounds as though you had a lovely holiday and I love all your photos. I'm very interested in the storks - it is great to see them able to nest on people's homes. 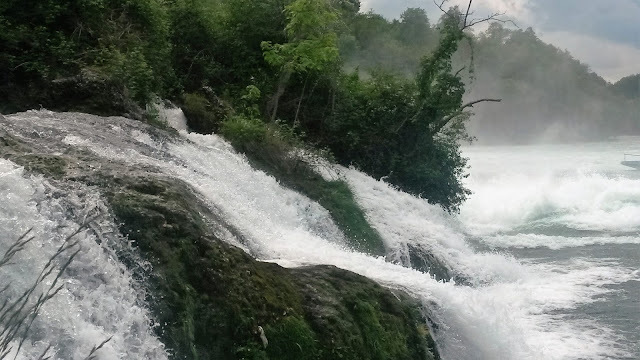 The Rheinfall I've seen, but I always wanted to do a Rhine cruise! What a beautiful cruise that must have been even though you live in the most beautiful place I've seen. Thank you for taking me along on a virtual tour with you... The photos are breathtaking! I've never been on a cruise - one like yours sounds like a good way to do it. The scenery looks wonderful - pretty towns, castles and countryside - a feast for the eyes.I'm glad you made it safely along the swollen river. Seeing storks must have been amazing too. So beautiful! Amazing nature, so green...love your pictures from the journey! Have a sunny tuesday, take care. Beautiful!! !I have travelled on the Mosel Wine route and have taken a little cruise along the river. I remember most of the places you are showing here.Such an amazing region.Your photos give it credit! This is a trip that we've always wanted to do since traveling down through the Rhine Valley by train so I really enjoyed your post. It sounds as if you had a most enjoyable albeit adventurous trip. I know what you mean about the bridges looking alarmingly low. We went on a cruise down the Rhone from Lyon to Arles a few years ago and were surprised by the number of locks en route. Did you go through many on the Rhine? I so enjoyed travelling with you, Sarah. I've always wanted to visit this part of the world and it is every bit as pretty as I've imagined. Who can resist floating down a river and watching the world pass by? Amazing. Fortunately the high water didn't disrupt your trip too much. My mother's cruise down the Danube a few years ago was halted because of low water levels. They were put on a bus. Not a good outcome. Not being a boat person the cruise, especially in those conditions, would have spooked me a bit. But a lovely part of the world to experience. I love being near water (rather than on it!) just to see the wildlife. Lovely post and pictures Sarah glad you enjoyed it, they must have had loads of rain to cause all those floods, at least it didn't hamper your journey too much. I have always wanted to take a European river cruise, but Steve hates the idea of a cruise. What an amazing holiday and such beautiful scenery! I had a short holiday with a friend some years ago, in the Ahr, Rhine and Moselle valleys. I would love to go back. What a wonderful cruise you must have had and I loved seeing your amazing photographs. The scenery so beautiful with the castles, rivers and wildlife. It must have been a relaxing time not having to drive. Have never been on a cruise, but my sister has and she enjoys them. Hello Sarah - I must just say I love your header/banner, lovely colour. Your cruise photo's are just lovely, even though your weather was not what you expected, the sights you have shared with us are so beautiful. Hope your weekend is going well, you're probably catching up with gardening! It's so lovely to see your photos of your Rhine trip, what a very beautiful place it is. We went on a Rhine cruise years ago, sadly though we didn't cruise, we just floated as flooding meant we had to remain moored up. We did get out on a coach though, lol. I really enjoyed reading this post. We lived in Germany for four years in the 70s and our flat looked over the start of the "interesting section of the Rhine" just south of Bonn. We could see the Drachenfels, and vineyards, and took the Rhine boats up and down the river for Sunday outings. I went back in June 2014, for a reunion, and realized that I had not appreciated the beauty of the river when I lived next to it.